July 2017 is a bit of a big one, as months go. London holds its 45th annual Pride Parade, the UK's largest, on Saturday 8 July, the culmination of this year's Pride Festival – and it's also the anniversary of two crucial milestones in the advancement of gay rights: the publication of the Wolfenden Report in 1957, and the partial decriminalisation of male homosexual acts enacted by the Sexual Offences Act 1967. 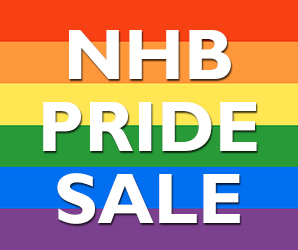 So to mark the occasion, we're running a very special NHB Pride Sale. From now until the end of July, you can save save 30% on twelve hand-picked, NHB-published plays that chronicle, capture and celebrate LGBT+ experiences and voices, when you use code NHBPRIDE at checkout when ordering via this website. To find out more, and see what's included, browse the NHB Pride Sale page.